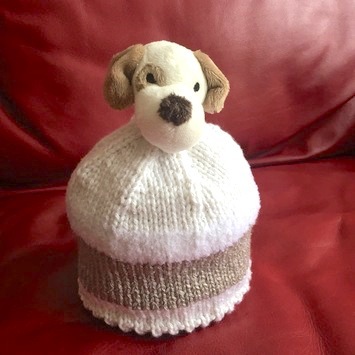 On this page visitors can find free children knitting patterns created by myself and others. My first easy knitting pattern page is getting too long and causing too much time to load the page. My plan is to make each page into specific category instead of mixing them all up. Hopefully, this will create a better user experience. I'm still experimenting it, so bear with me. In the mean time, enjoy these children knitting patterns. If you have any suggestion or a pattern you want me to add to this page, please let me know by using submitting form below. Happy Knitting! **New*** Just added March 6, 2019. Super cute baby and child hat pattern. Perfect for a child age1-3 or even 4. The yarn is very elastic and comfy. A must try hat! Watch this video if you decided to make one of the skirts below and don't quite know how to add an elastic band to the waist. I think it will help a lot. 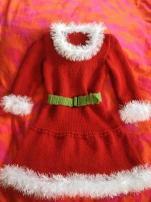 Little Miss Claus Holiday Dress/Costume - knit this pretty red dress for your girl for upcoming holiday or costume party. You'll be the fave one. available in size chest 25" only at this time. 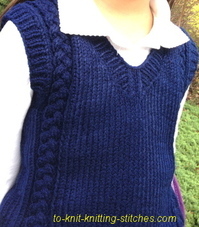 A lovely vest pattern for boys and girls age approx 3-8 year-old. Available in 3 sizes (22, 25 and 27"). Just can't seem to get away with purple yarn. This is another nice soft hand dyed cotton/bamboo yarn I love. 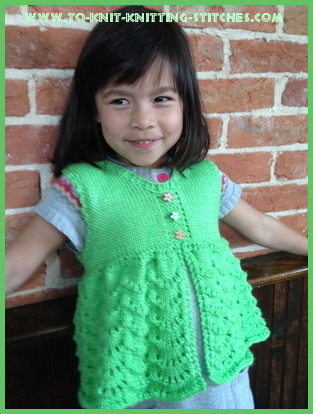 The tank is fun to knit and my little girl loves it. She even picked out her own teacup and teapot buttons! Just finished this one in time for hot Summer days. This tank is pretty easy to knit. Just need a little patience and concentration on the pattern. I love the little bow added on to the front. This is my 2nd vest pattern I have designed. 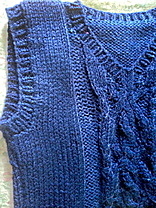 It was much easier to knit this vest than to write the pattern. Thanks to one of our visitors who had asked for a vest to match with the scallop-edge skirt. It's pretty cute, I think. You can wear it with or without the matching skirt. It turned out just what I had picture in mind. Give it a try. I think you'll like it. A cute little skirt for girls age 2-4. It has a lace diamond border on the bottom part of it. You can also add crochet edging to it as well. Pink Scallop Edge Skirt * The most popular skirt on and off the site so far. 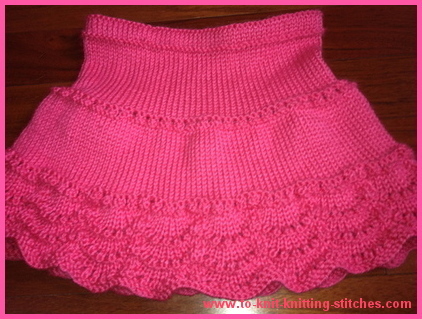 My youngest twin daughter requested a pink skirt. This scallop edge skirt was the result of her request. I really like the look of the edge - curvy and crochet-like stitches. It one of my favorite designed and it's really easy to knit. This short skirt is perfect for any little girls. It has a nice lacy touch on the top portion. Add a flower to it if you like. I knitted this one for my niece's two years-old daughter, Mia. 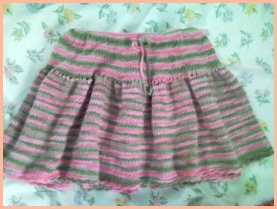 I knitted this twirly skirt for my daughter as a school uniform. 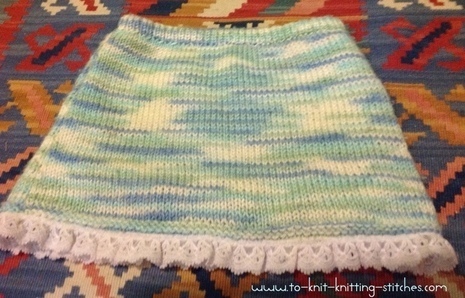 The skirt looks very nice, but a little bit disappointed in the yarn. 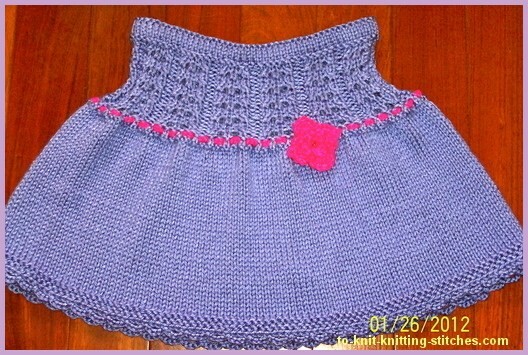 A cute and simple to knit toddler skirt knitted in rounds. It's perfect for summer outing. This is another skirt I designed for my twins. It's very easy to knit. My daughters just love it. 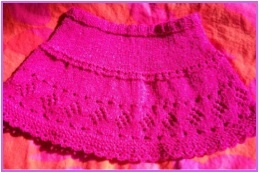 Simple knitted short skirt with preexisting lace sew on the lower edge. Girl or boy hat in blue with red rolled edge. Finishing touch for a girl's hat with little white crochet flowers. 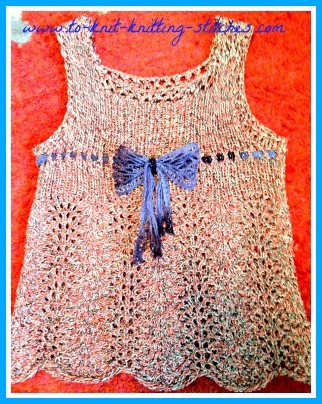 You can make this out of left over yarn and finish in a day or two. 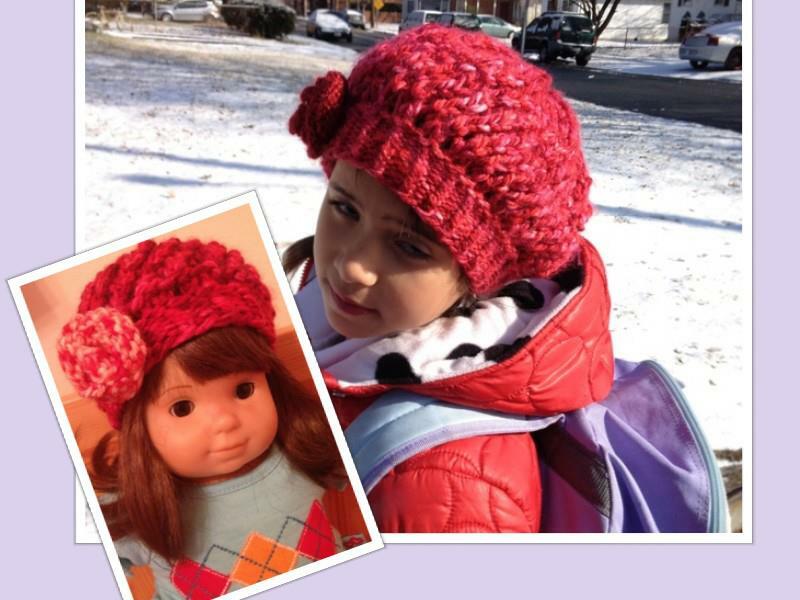 Strawberry twirl hat with a matching hat for American girl doll bitty baby. I love looking at my girl wearing this hat. It's so sweet and cute! A bag every girl must have! Easy to knit small shoulder bag for small and big girls. 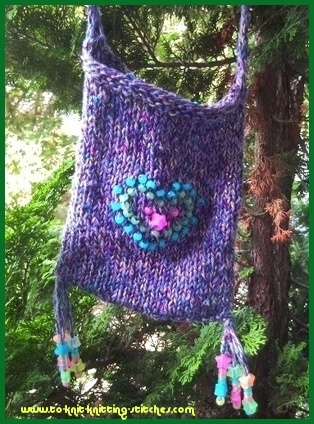 The beads are knitted in the body of the bag to form a heart shape. Your girl will fall in love with this cute and handy shoulder bag. Kid's Fingerless Mittens ** I made them and they're very cute! Designed by a mom who worries about her daughter's hands being so cold while waiting for a school bus. She wants her daughter to get to school with warm hands and ready to learn. These mittens are very pretty and colorful with a finishing touch of french knot. I am planning on adding some easy boy patterns in the future. 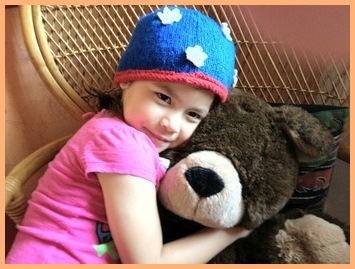 Thanks for visiting children knitting patterns page.